You, with your learning and your double degrees in ornithology and transportation theory. I’ll bet you never suspected that you’d find yourself in a situation in which you weren’t sure whether something was a bird or a train. Well, my smug friend, I’d like to introduce you to the Inaccessible Island Rail. You might name this little guy a lot of things — perhaps Stubtailed Walking — but the generic English name he got stuck with was Inaccessible Island Rail. It resides only on Inaccessible Island — itself an unenticingly named thing — on the Tristan Archipelago, which floats haplessly between Africa and South America. 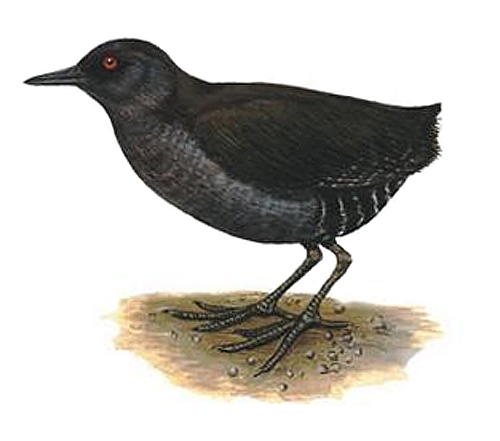 It belongs to the rail family of birds, as do the similarly miserably named cracks, coots and gallinules. And while the Inaccessible Island Rail happens to be the smallest living flightless bird in the world, I enjoy that someone overhearing a conversation about it might easily conclude that it was just the world’s most poorly planet public transportation system. Clearly a fraud. If the island is inaccessible, how did they discover the bird? Not related to the post, but I wanted to tell you that I love your new layout.